Pimp turned rapper turned actor. Announced in 2012 that he now wants to be called "Snoop Lion." Daniel Burke, "Why did Snoop Dogg change his name when he became a Rasta? 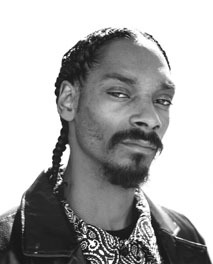 ", Religion News Service syndicated to The Washington Post, 2 August 2012: "I want to bury Snoop Dogg and become Snoop Lion... I feel like I've always been Rastafari, I just didn't have my third eye open."